When should you debate someone, in person or online? It's hard to make that call. On the one hand, sometimes debate is worth the effort. People can change their minds, or open them up a bit. Sometimes debate fosters if not agreement than mutual respect. Debate well done can be humanizing. But on the other hand debate can be like talking to a brick wall. No one is listening, there is no openness to the risk of actually learning from each other. The debate devolves into flame-throwing, scoring points and the dehumanization of ad hominem attacks. How to make a judgment about how a conversation with a person might go? Something to ponder here is a notion that psychologists call "stages of change." What I want to focus on are the first two stages of change, precontemplation and contemplation. When someone is struggling or having issue but are in denial about it they are in what is called the precontemplation stage. That is to say, this person isn't even willing to contemplate, think about or talk about having a problem. Their mode of thought is, "Problem? What Problem? I don't have a problem." As you might guess, change is hard for anyone in the precontemplation stage. If you're not willing to even contemplate that you might have a problem it's hard to get you to admit the problem to say nothing about actually changing to resolve the problem. 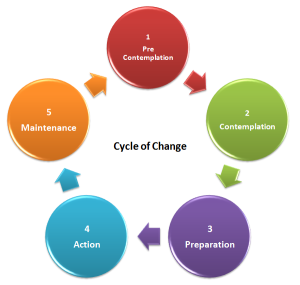 The second stage of change is when you move from precontemplation to contemplation. Enough has happened in your life that you are open to considering the fact that you might have a problem. You're not yet ready to change, but you've begun the process of thinking about a change. I think we can apply these same ideas to debate, how open we are to changing our minds. Some debating partners are in a precontemplation stage. They are unwilling to even entertain the possibility that they might be wrong. Consequently, conversation partners in the precontemplation stage see the conversation as a one-way street: you have to change your mind because you are wrong. In short, I'd avoid debate with anyone who seems to be in the precontemplation stage. By contrast, debating partners who are in the contemplation stage are willing to entertain the possibility that they might be wrong. To be sure, they aren't saying they are wrong and they might not change their minds. But they are at least open to the risk of the conversation, to the risk of being persuaded, to the risk that the conversation might change them, perhaps in lasting and significant ways. And finally, and perhaps most importantly, there's how all this applies to my side of the conversation. If my goal is only and always trying to change the mind of the person I am debating what does that say about how open I am to change?